COLLEGE PARK, Md. (AP) — Virginia had blown most of a 17-point lead and appeared in trouble as the sellout crowd at Maryland implored the home team to complete the comeback. The Cavaliers had been in this situation before, and they knew exactly how to handle it. Showing the kind of poise befitting the fourth-ranked team in the country, the Cavaliers took good care of the basketball and exhibited cool at the foul line in slipping past the No. 24 Terrapins 76-71 Wednesday night. Hitting shots from long range and playing its usual stout defense, Virginia (7-0) built a 48-31 lead with 16:29 left. Maryland (6-1) closed to 63-59 before Ty Jerome popped a 3-pointer and Jack Salt added a dunk, and the Cavaliers closed it out by making six free throws in the final 37 seconds. With a roster that includes several returnees from a team that entered last season’s NCAA Tournament as a No. 1 seed, the Cavaliers are already battle-tested. Guy nailed five 3-pointers and the Cavaliers went 10 for 22 beyond the arc. Virginia committed only two turnovers — both offensive fouls — which speaks volumes about the Cavaliers’ ball-handling prowess. De’Andre Hunter scored 15 for Virginia, which improved to 121-35 in nonconference games under coach Tony Bennett. Virginia has won 25 straight in November, dating back to 2015. 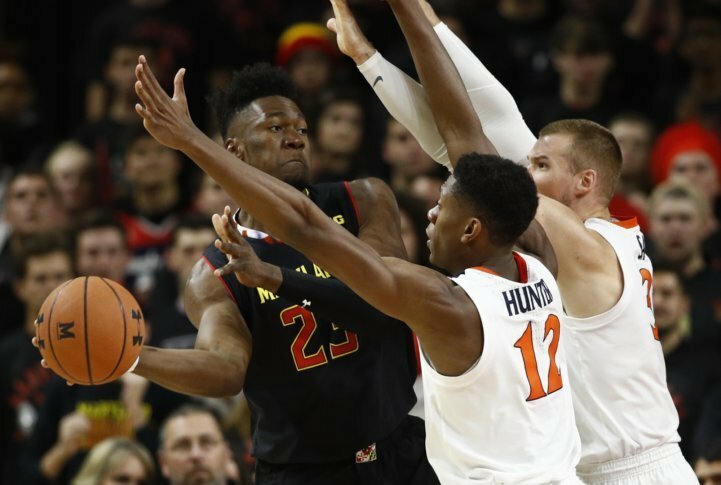 Bruno Fernando had 14 points and 11 rebounds, and Anthony Cowan Jr. scored 15 for the Terrapins, whose 35-23 rebounding advantage was offset by 14 turnovers. “It just comes down to turnovers,” Turgeon lamented. Maryland was, however, the first team this season to break the 60-point barrier against the Cavaliers, no small accomplishment for a team with six freshmen and four sophomores. Maryland and Virginia first met in the 1912-13 season and were both members of the ACC before the Terrapins joined the Big Ten in 2014. The Cavaliers trail in the series 107-76 but have won eight of the last nine. It was Virginia’s second straight victory over a Big Ten team. The Cavaliers defeated Wisconsin last week to win the Battle 4 Atlantis. Guy scored 15 points and accounted for four of Virginia’s eight 3-pointers in a first half that ended with the Cavaliers up 39-30. Maryland made only one less basket than Virginia and held a 19-11 rebounding edge, but the Cavaliers’ 8-for-16 shooting beyond the arc made all the difference. Also worth noting: Virginia had 11 assists and only one turnover through the first 20 minutes. Virginia held the lead for 35 of 40 minutes, and never trailed over the final 31 minutes. “They hit some tough shots at the end but it was enough,” Bennett said of 17-point cushion. Virginia: The Cavaliers played their usual brand of suffocating defense and added an outside shooting touch to knock off a ranked team and solidify their stature in the top 5. Maryland: If this game was held later in the season, perhaps the young Terrapins would have fared better. At this point, however, they’re not quite good enough to compete against a talented squad with a tenacious defense. Virginia plays a Maryland-based team for the fourth time this season, hosting Morgan State on Monday night.